As the visions during the night continued, I saw one like a Son of man coming, on the clouds of heaven; when he reached the Ancient One and was presented before him, the one like a Son of man received dominion, glory and kingship; all peoples, nations, and languages serve him. His dominion is an everlasting dominion that shall not be taken away, his kingship shall not be destroyed. 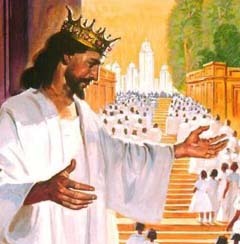 R/ The Lord is king; he is robed in majesty. The Lord sits as King forever. The Lord will bless his people with peace.